North Korean leader Kim Jong-un’s wife crossed the border hours after her spouse to attend a banquet hosted by South Korea on Friday. Ri Sol-ju arrived at the Peace House in the South’s side of the truce village of Panmunjeom at 6:18 p.m., wearing a pink dress. The Peace House served as the venue for talks between South Korean President Moon Jae-in and North Korean leader Kim earlier in the day. 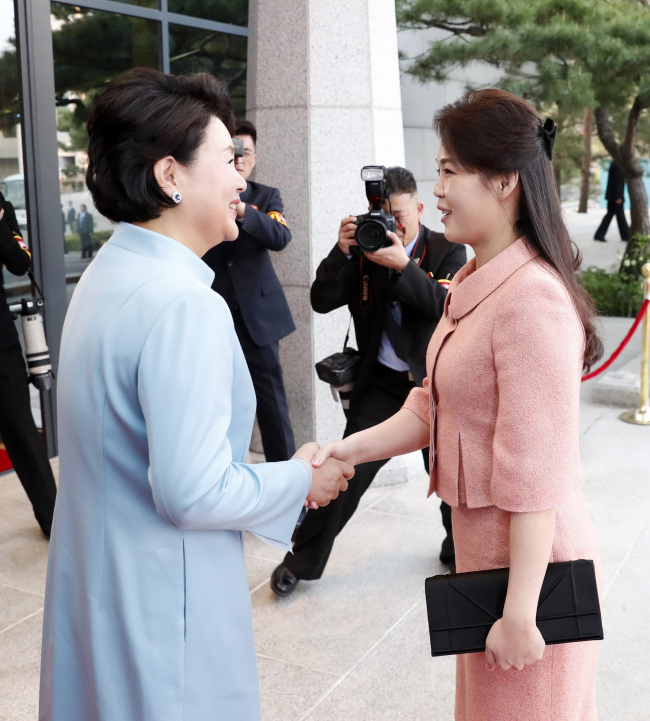 Although experts were expecting Ri to accompany Kim on his cross-border trip, her attendance at the banquet remained unconfirmed until later in the day. She was also not included in the list of the North’s summit delegation. Ri, who was first officially introduced as Kim’s wife through state media in 2012, has been addressed in her country as the “revered first lady” in recent weeks. This is a shift from her previous label of “comrade,” indicating an elevation in her status within the Kim family and the North’s regime. Ri had also accompanied Kim to China when he made his diplomatic debut last month at a summit with Chinese leader Xi Jinping. Her trip was deemed unprecedented as Kim’s predecessors had a habit of traveling without their wives on foreign trips. Kim Ok, late North Korean leader Kim Jong-il’s fourth wife and also his personal secretary, had often accompanied him during his trips to China and Russia but not formally as his spouse. Although much of Ri’s personal history remains veiled, she was spotted in photos taken in South Korea during the 2005 Asian Athletics Championships in Incheon as part of the North’s cheering squad. Kim and Ri have three children together, according to the South’s spy agency. Former NBA star Dennis Rodman, who visited Pyongyang in 2013, had mentioned to a group of reporters that one of Kim’s daughters is named Ju-ae. The names and genders of her siblings are still unknown. 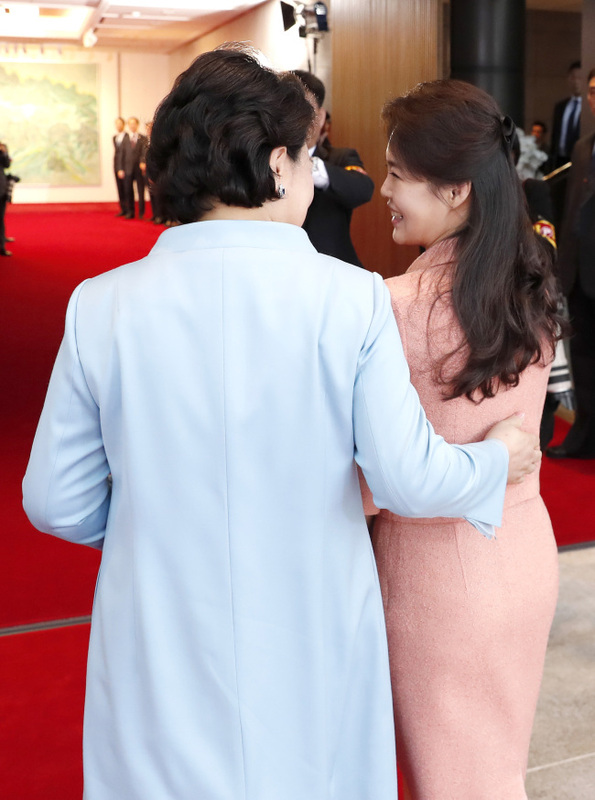 When Ri arrived at the Peace House, South Korea’s first lady Kim Jung-sook, who had been waiting for Ri at the doorstep, extended a warm welcome before entering the building together. Upon entering, Moon and Kim Jong-un who were standing together, had a brief chat with Ri and Kim Jong-sook. The four then participated in a photo session.